Would You Pay Almost $60,000 For A Cell Phone? For most people, a couple of hundred bucks is a lot of money to throw down for a cell phone. However, Danish retailer Aesir has a new model that's going for way more than that, and with way fewer features. The new model doesn't play games, access the internet, have a camera, or even feature an email app (though it will allow users to send text messages), but it's totally made from gold and is selling for $57,400. 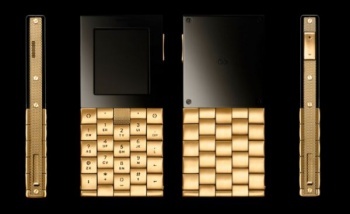 Aesir is apparently marketing its 18-carat gold (limited-edition, of course) phones at "Moscow's fashion-forward elite." If that demographic doesn't sound too familiar, here's a translation: Aesir wants to sell these phones to super-rich people who have other (less rich) folks who manage their calendars, read their emails for them, and drive them around town while using cheaper phones with GPS features. Speaking to Reuters, Aesir founder Thomas Jensen explained that the phone is "not a play thing ... It's a collector's item. People are used to collecting, say, watches, while designer phones is a practically empty niche." Aesir is reportedly going to design a new phone every 18 months, which it will only produce 5,000 units of. Currently, the plan is to sell the gold model for the aforementioned price and a stainless steel version for $9,867. $57,400 is a lot of money, no matter what you're planning to spend it on. In fact, there are a lot of better uses for that amount of cash. You know, like a college education.